For the past thirty years, the AGTA Spectrum Awards has recognized designers within the jewelry industry. Considered the finest jewelry competition in the world, the Spectrum Awards places emphasis on use of natural colored gemstones and cultured pearls. Each piece is carefully inspected during the judging process by a panel of experts from a variety of fields within the jewelry industry. Entries are graded on wearability, beauty, use of materials, quality of gemstones and workmanship, innovative design and the ability to generate positive publicity for natural colored gemstones. For the 2016 Spectrum Awards, Green Lake’s gold and platinumsmith, Joe Worley, submitted his piece “The Trembling Lily” in the Classical, Evening Wear, and Business Day Wear categories. 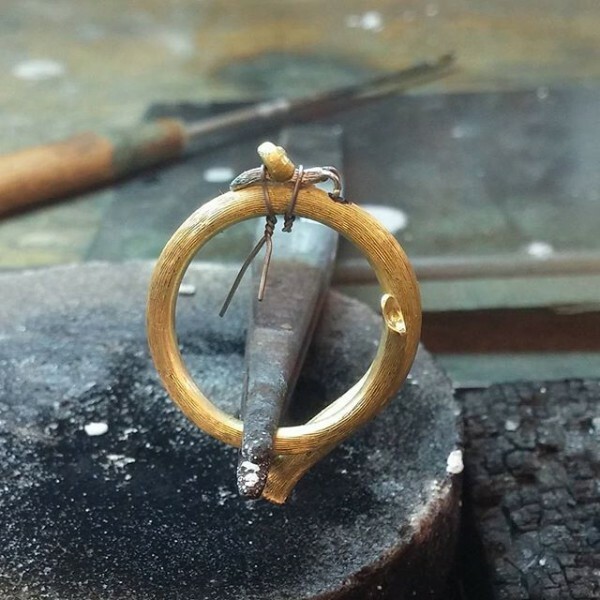 Hand fabricated from 18-karat yellow Fairmined gold, Worley began the production process by pouring an ingot and rolling out various types of stock he needed such as bar, sheet and wire as well as making his own tubing. 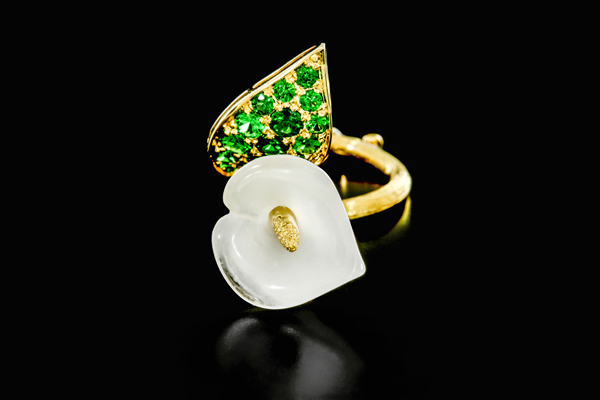 For the center, “The Trembling Lily” features a hand-carved piece of moon quartz provided by Green Lake’s lapidary and gemologist, Daniel Canivet, as well as untreated yellow diamond pave around the stamen. The moon quartz was carved over the course twenty hours, going from grinding to polishing, and adding the final finish. 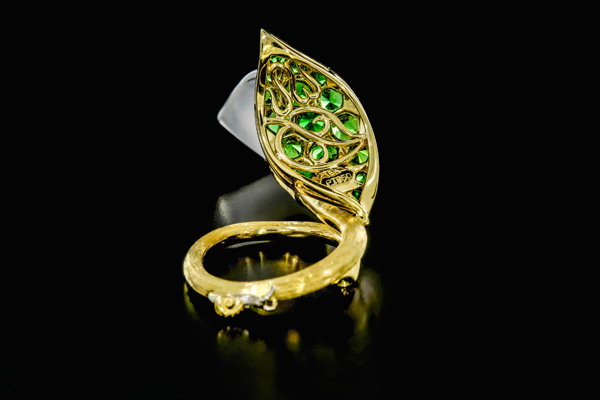 Worley chose larger tsavorite garnets for the leaf and pave-set them for a more classic feel, as opposed to calibrated melee that would give a more contemporary aesthetic. Ten years ago, Joe came across a 1920’s era butterfly brooch with wings ‘en tremblant’ (an element that subtly trembles) and immediately wanted to try the technique. “The Trembling Lily” was the perfect project to incorporate the en tremblant technique Joe had become enamored with years prior. 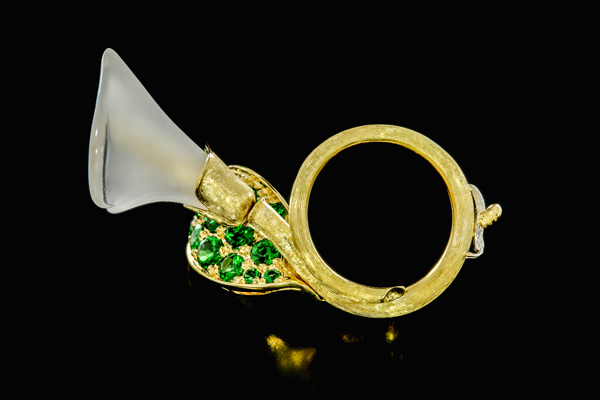 To create such an intriguing ring, meticulously thought out assembly and production stages were required. Pre-production for the ring lasted about four weeks, with the entire concept to completion lasting ten weeks. The opening shape of the flower was vital; once the shape was correct, Worley hand fabricated the metal to the exact shape of the flower, ensuring that the lily would remain secure within the gold base. When top heavy issues due to the moon quartz arose, Worley counteracted the weight with a delicate snail at the base of the ring in platinum. The shell of the snail was created with one piece of tapered heavy wire bent into a spiral and the body is a piece of platinum bar stock, shaped with two pieces of wire with the ends balled up. Techniques such as a keyed cap and slotted bayonet fitting for the stamen, rivets to hold the petal on the stem and rivets to attach the spring for the en tremblant were used. For the en tremblant spring, Worley decided to use an especially hard white gold alloy (white gold was decided upon instead of steel so rust wasn’t a factor). It’s hard to believe this is the first en tremblant piece for Worley. “The Trembling Lily” is both innovative and grandiose, yet retains a great deal of delicateness due to the material and design. Though the piece didn’t win in this years competition, Worley said he is “nothing but grateful for the opportunity to design and make a piece of it’s caliber for our shop, and happy with the results of the hard work we put in to it.” Green Lake Jewelry Works is proud to have such skilled artisans, both Joe Worley and Daniel Canivet, on our team and we look forward to future creations to come!